As soon as President Donald Trump announced Tuesday that he was selecting federal appeals Judge Neil Gorsuch for the Supreme Court, the battle over his confirmation was well underway, with Democrats questioning his record on women's issues and corporate interests. But Republicans praised the pick as "an outstanding choice" and confidently predicted victory. The battle will be waged in the Senate, where Republicans have the majority needed to confirm Gorsuch but are short of the 60 votes needed to break a filibuster should Democrats mount one. At least one senator, Democrat Jeff Merkley of Oregon, indicated even before the announcement that he would seek to filibuster any selection. The Senate Democratic leader, Chuck Schumer of New York, did not go that far after the announcement, saying, "The Senate must insist upon 60 votes for any Supreme Court nominee." If Democrats do filibuster the pick, Senate Majority Leader Mitch McConnell, R-Kentucky, could seek a change in Senate rules to prevent a filibuster on Supreme Court nominees, commonly referred to as the "nuclear option" because it would eliminate a longstanding tool of the minority party. 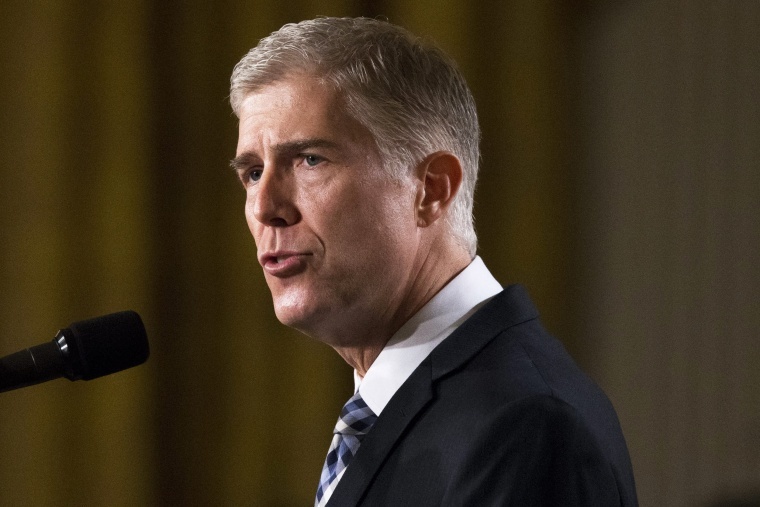 "Judge Gorsuch understands the invaluable contribution to the federal judiciary and our democratic government made by the justice he is succeeding," McConnell said in a statement, referring to Antonin Scalia, who died in February 2016. "Like Justice Scalia, he understands the constitutional limits on the authority of a federal judge and that the duty of a judge is to apply the law even-handedly, without fear or favor, and not to rule based on one's empathy with a party in a case," McConnell said. Republican Sen. Lindsey Graham of South Carolina called Gorsuch's selection "a great choice." "He's going to get confirmed. It's just a matter of when and how," Graham said after Trump's prime-time announcement Tuesday night. Opponents pointed to Gorsuch's joining the majority in Hobby Lobby Stores Inc. v. Sebelius, in which he and others on the 10th U.S. Circuit Court of Appeals ruled in favor of the owners of a chain of stores who argued that their religious convictions would be violated if they were required to provide contraceptive insurance under the Affordable Care Act. Gorsuch wrote a separate, concurring opinion that stressed the importance of the country's tradition of religious freedom. "After the relentless contempt for women that candidate Trump displayed throughout his campaign, it is no surprise that President Trump intends to place someone hostile to women's rights on the Supreme Court," said House Democratic leader Nancy Pelosi of California. "In the Hobby Lobby case, Judge Neil Gorsuch revealed his eagerness to single out women's health for discrimination and enable employers to meddle in their workers' most intimate health decisions," she said. The group NARAL Pro-Choice America called the selection "a clear declaration of war on our right to choose" and one that threatens Roe v. Wade. Planned Parenthood said Gorsuch has "an alarming record" and said the judge must clearly affirm his support for the 1973 decision. The conservative Judicial Crisis Network hailed Gorsuch in a tweet as "exceptionally qualified" and a judge with "a record of applying the Constitution as Framers intended." Republican Sen. Chuck Grassley of Iowa, chairman of the Judiciary Committee, called Gorsuch "universally respected." "By all accounts, he has a record of deciding cases based on the text of the Constitution and the law," Grassley said. "That's important, because in our system of government, Congress, not judges, make the laws." Gorsuch was picked to fill the vacancy left by the death of Scalia. Senate Republicans blocked President Barack Obama's pick, Merrick Garland, , chief judge of the U.S. Court of Appeals for the District of Columbia Circuit, instead gambling on deferring the choice to the next president. Republicans have a 52-46 majority in the Senate, with two independents. "The Senate must insist upon 60 votes for any Supreme Court nominee, a bar that was met by each of President Obama's nominees," Schumer said in a statement. "The burden is on Judge Neil Gorsuch to prove himself to be within the legal mainstream and, in this new era, willing to vigorously defend the Constitution from abuses of the Executive branch and protect the constitutionally enshrined rights of all Americans." "Given his record, I have very serious doubts about Judge Gorsuch's ability to meet this standard," Schumer said, citing what he said was a record that shows the judge has sided with corporations over working people, as well as "a hostility to women's rights." In an interview on MSNBC, Merkley called Gorsuch's nomination "a stolen seat" because of the Senate's refusal to take up Garland's nomination. Sen. Elizabeth Warren, D-Massachusetts, was also among those who pledged to oppose the pick. "President Trump had the chance to select a consensus nominee to the Supreme Court. To the surprise of absolutely nobody, he failed that test," she said in a statement. "Instead, he carried out his public promise to select a nominee from a list drawn up by far right activist groups that were financed by big business interests." Tom Perez, a candidate for chairman of the Democratic National Committee, called on Democrats in a statement to block the nomination. Asked whether Republicans would consider the nuclear option, Graham — a member of the Judiciary Committee — wouldn't take it off the table. "It'd be sad to me if we have to go that route with a man like this," Graham said. "But he's going to get confirmed."